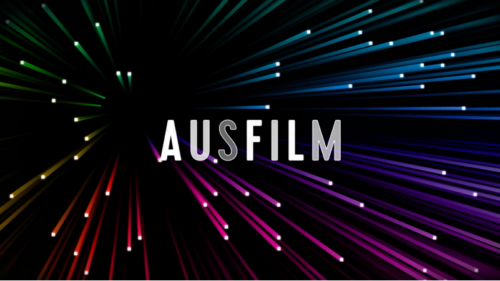 Ausfilm member Fox Studios Australia, has recently been home to major Hollywood blockbusters including Alien: Covenant, Pacific Rim: Uprising, Peter Rabbit and Hacksaw Ridge. Ausfilm sat down with Fox Studios Australia’s Managing Director Wayne Borg to get the scoop on what it’s like to facilitate these productions – and what makes Fox so unique. I was always a great film fan and when I went to London looking to secure a job, I couldn’t believe my luck when a recruiter put me up for a role at Disney. I was successful. And from there the journey began with my first role in the industry working for Disney in London. I started my career as a graduate marketing trainee at Unilever then moving to PepsiCo. Disney was keen to bring more disciplined marketing to the business and started recruiting from the packaged goods industries. From Disney I moved to Warner Bros. in London in commercial and management roles and then back in Australia, before setting up and leading Universal operations here in Australia and then returning to London with Universal in a number of international leadership roles spanning Asia Pacific, Latin America, Europe and Russia. The day starts very early. Normally up at 5.30 and walking the dog by 6. I think that’s where the routine ends. Leading the Fox Studios Australia team is a varied and dynamic role. It’s a large and complex business with many moving parts and facets that span a wide variety of areas. We have over 3,000 people based at the studio and 85 businesses that expands by a further 1,000 to 1,500 people when productions are on the Lot. No two days are ever routine. Every day will be different, whether it’s speaking with clients on the west coast of the US or in China, or liaising with colleagues at the studio in LA, meeting with clients and prospective clients locally, speaking with Government representatives Federally and at a State level, or managing through group corporate Twentieth Century Fox issues locally, or my duties as an Ausfilm Board member and Screen Producers Australia Council member. It’s diverse, stimulating and rewarding. How important is customer service to Fox Studios? What is your unique selling proposition and why do productions keep coming to Fox Studios? Service and support is ultimately what we are about. Our role is to facilitate and support our clients in whatever their needs may be. Be they productions, businesses on the Lot, or stakeholders. Superior customer service is our focus, making the impossible happen. Proven world class facilities/backlots on a scale and in the centre of a major global city that is unparalleled in the southern hemisphere. The quality and depth of crew based in Sydney that are recognised as the world’s best. Proximity to diverse locations that can double for a vast array of location needs from tropical beaches, coastal, jungle, mountainous, arid, alpine, metro and urban and can double for virtually any requirement, from Manhattan New York, wartime Tokyo, Okinawa, West Virginia and the English countryside. 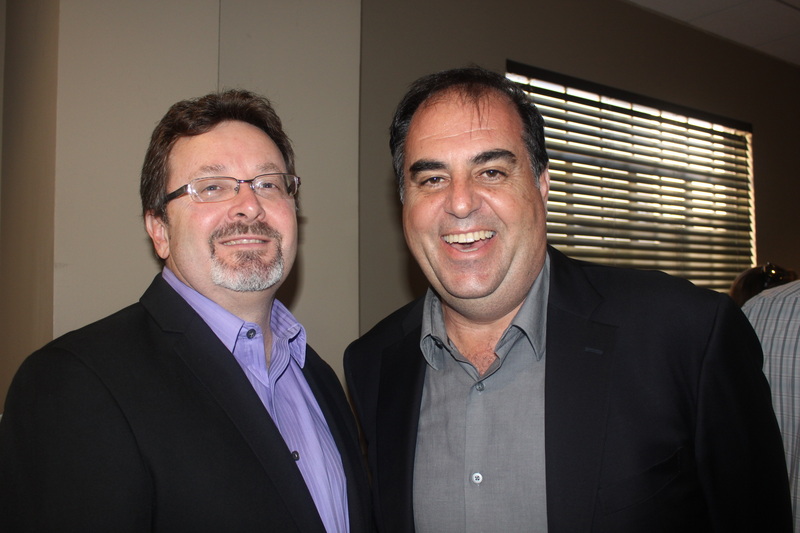 We have great support from local and state government and their film friendly protocols and attractive incentives. 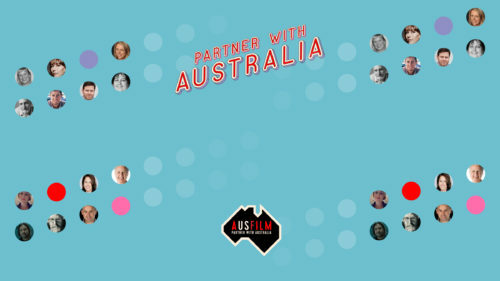 Furthermore, over half of all Australian production and post-production businesses are located in New South Wales and Fox Studios Australia home to over 85 screen production support businesses covering production services, casting, equipment hire, post production, visual effects, music scoring and sound design. This ecosystem is internationally recognised as having many of the industry’s leading edge businesses globally. This package provides great value that producers are constantly striving for, through fantastic levels of efficiency and productivity, combined with the capacity to host the most challenging and demanding of productions. No other studio in Australia or the southern hemisphere provides the level of integrated facilities, services and support, as that provided at Fox Studios Australia. You’ve had Hacksaw Ridge film at Fox which is a medium budget size film, followed by two big studios films Alien: Covenant and Pacific Rim: Uprising. What kinds of differences do you find there are when working with big studio films vs. smaller-medium sized productions? Every production is unique. Whether it’s a first-time director making their debut budget feature, or a major Studio film, our focus and priorities are the same. It’s ensuring we play our part to meet the production’s needs and do it as efficiently and effectively as possible in the best working environment the industry has to offer anywhere in the world. There are always challenges and opportunities with productions in what they are trying to achieve on screen. Our role is to ensure we support them to achieve what they need and anticipate and address problems before they arise and that the process is smooth and enjoyable. Tell us about the size of the production on Hacksaw Ridge? How many sound stages did they use? We had been working with Bill Mechanic on a plan that utilised the studio, Sydney and the State to cover all their shooting and location needs. We were excited when along with Create NSW (the newly amalgamated agency incorporating Arts NSW and Screen NSW from 1 April 2017), we secured the production for the Studio and the State. The film generated around 720 direct jobs and over AUD$26 million in production expenditure across central Sydney, Western Sydney and regional NSW. At Fox Studios Australia, where the production was based, Hacksaw Ridge, occupied 4 sound stages and production support areas including back of house, production offices, art/costume craft shops and construction workshops. In addition, the film utilised backlot areas and accessed the services of the screen production support businesses based on the lot including equipment hire and post production. The production required large set builds at the studios and on location in Bringelly where WWII battlegrounds and barracks were recreated. 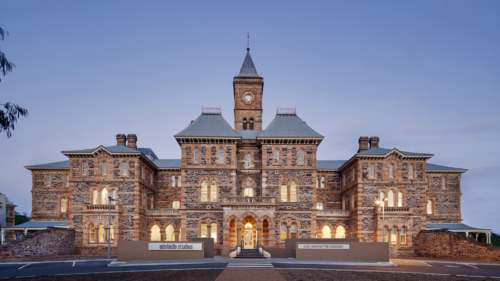 Other locations included the small town of Richmond which doubled for Lynchburg Virginia, Newington Armoury at Sydney Olympic Park which doubled for Fort Jackson in South Carolina and parts of Goulburn, which doubled for the treacherous 400-foot cliff known as ‘Hacksaw Ridge’ in the WWII Battle of Okinawa. The production showcased not only the versatility of locations around Sydney and New South Wales but also how a production of this complexity could integrate locations with sound stages and art department, construction and post production, seamlessly. Did they shoot on your quasi-backlot of Centennial Park just round the corner from the studios? In actual fact, parts of the Studio Lot were used as a back lot (for some of the Virginian scenes) in addition to the vast parklands we have adjacent to the Studio here in Central Sydney. The cemetery that Desmond Doss’s family visits in the movie was filmed at Centennial Park. Centennial Park, located adjacent to Fox Studios Australia, is a film friendly 189 hectare / 467 acre grand park in the Victorian period tradition featuring formal gardens, ponds, lakes, grand avenues, statues and historic buildings. Feature films and television series filmed there, along with Hacksaw Ridge include, Peter Rabbit, Top of the Lake, Gods of Egypt, The Great Gatsby, Australia, X-Men Origins: Wolverine, Superman Returns, Star Wars: Episode I, The Matrix Reloaded, The Matrix Revisited, The Quiet American, Danny Deckchair, The Amazing Race (China), X-Factor and The Voice. 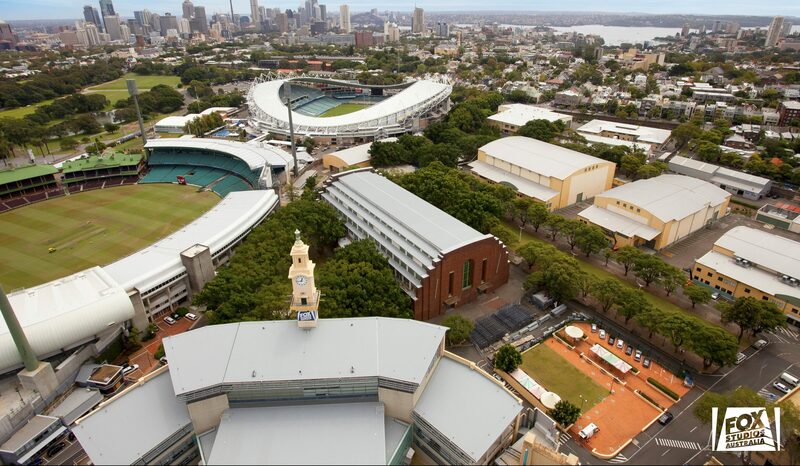 That’s the beauty of New South Wales and Sydney. We can stand in for contemporary and period New York, LA, period Tokyo, West Virginia, Okinawa, parts of Europe, modern Japan, futuristic cities, martian landscapes and lush exotic jungles. Were there any challenges on Hacksaw Ridge, and if so how did you resolve them? 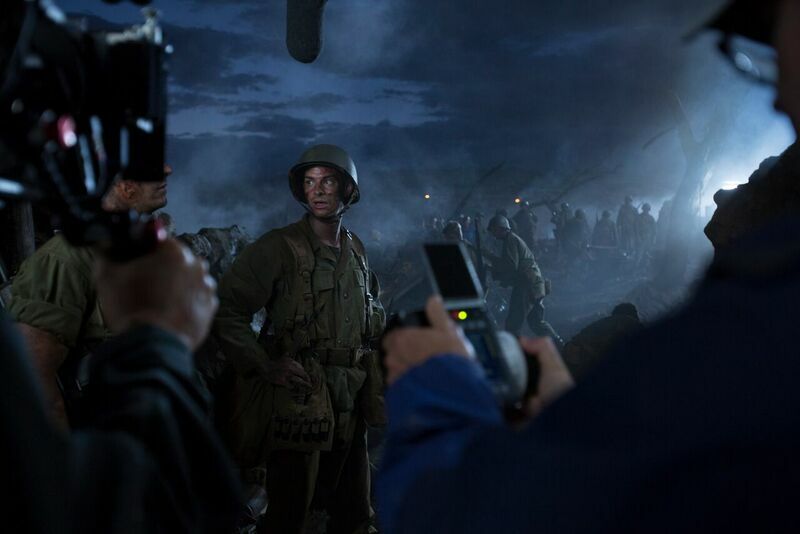 Hacksaw Ridge involved large-scale action to recreate the WWII Battle of Okinawa where an estimated 200,000 people were killed. 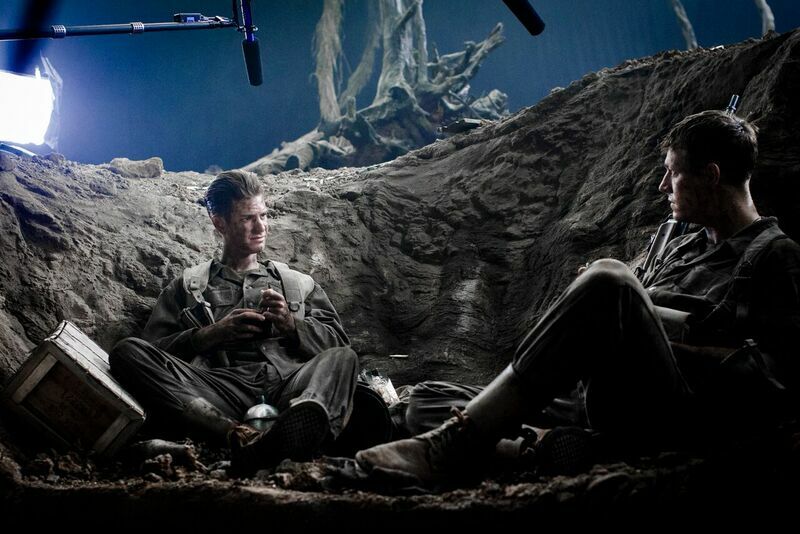 To authentically recreate this moment in history, a large number of actors and extras were required to film the battlefield sequences, which featured actors in foxholes and underground tunnels that were built at Fox, with the sets dressed in tonnes of dirt. It also involved the seamless coordination of hair, make-up and wardrobe requirements and coordinating the specific direction required from each actor and extra in each scene. Most challenging was the need to store and fire live firearms and detonate explosives which was meticulously managed to ensure the necessary risk management initiatives and regulatory approvals were in place. Hacksaw Ridge filming at Fox Studios Australia, image credit as above. You must be pretty pleased that Hacksaw Ridge won two Oscars® and a BAFTA? What was it like working with Mel Gibson and Bill Mechanic? It was a privilege to work with Mel Gibson and Bill Mechanic. They are great supporters of the Australian film industry so we were thrilled that Hacksaw Ridge won Academy Awards® for Best Achievement in Film Editing and Best Achievement in Sound Mixing and a BAFTA Award for Best Editing. Overall, the film has received another 40 wins and 76 nominations. 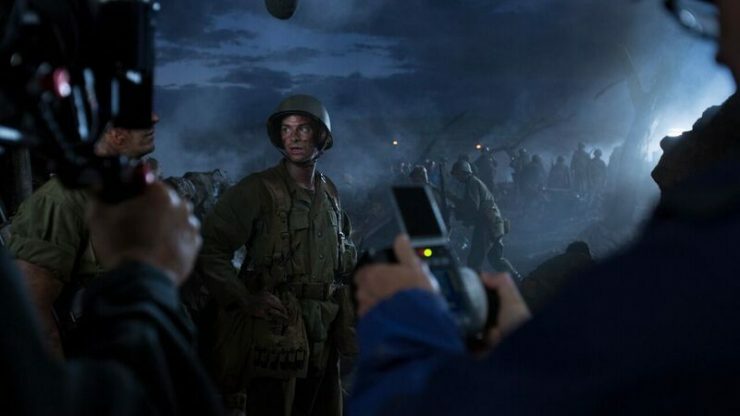 The success of Hacksaw Ridge is a testament to the highly skilled film and television industry practitioners we have here in Sydney, who are considered globally as industry leading. One of the main reasons major Hollywood film studios continually return to Australia for their feature productions is to work with this phenomenal talent pool. 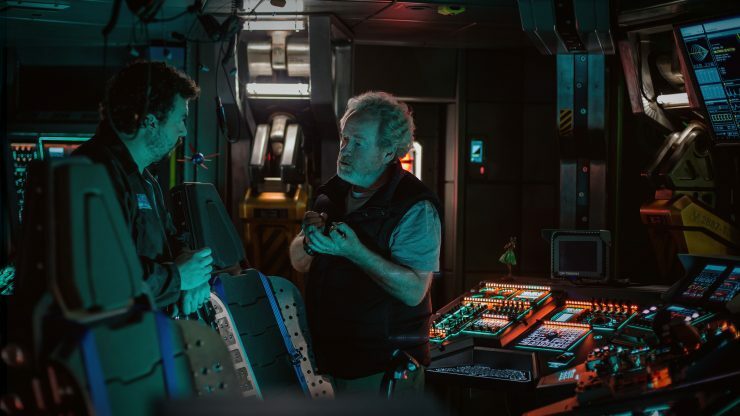 It’s been reported that Sir Ridley Scott really enjoyed his time in Sydney filming Alien: Covenant. Can you tell us about your involvement on this production? Alien: Covenant occupied seven sound stages and production support areas including back of house, production offices, art/costume craft shops and construction workshops within the studio complex. Much of the massive construction work for the backlot set was undertaken at the studio utilising our construction areas. 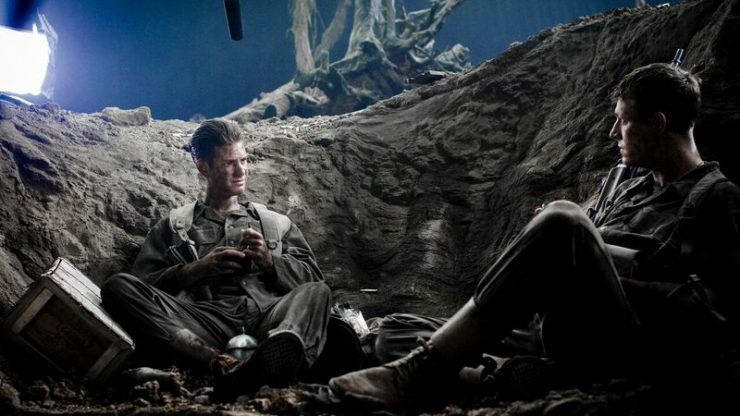 Alien: Covenant employed more than 600 local cast and crew directly and many more indirectly. It was an incredible opportunity to work with such an experienced and talented director like Sir Ridley, for our crews. 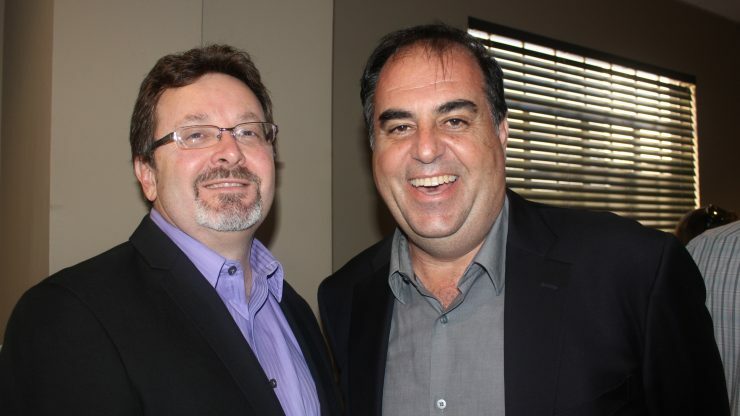 Plus the film contributed more than AUD$60 million to the New South Wales economy. From my conversations with Sir Ridley Scott, he expressed that living in Sydney and working at Fox Studios with our industry practitioners, was a fantastic and rewarding experience. Did they create big set builds? What was the length of time they shot at Fox Studios? Alien: Covenant occupied the studios from early November 2015 to mid-September 2016. 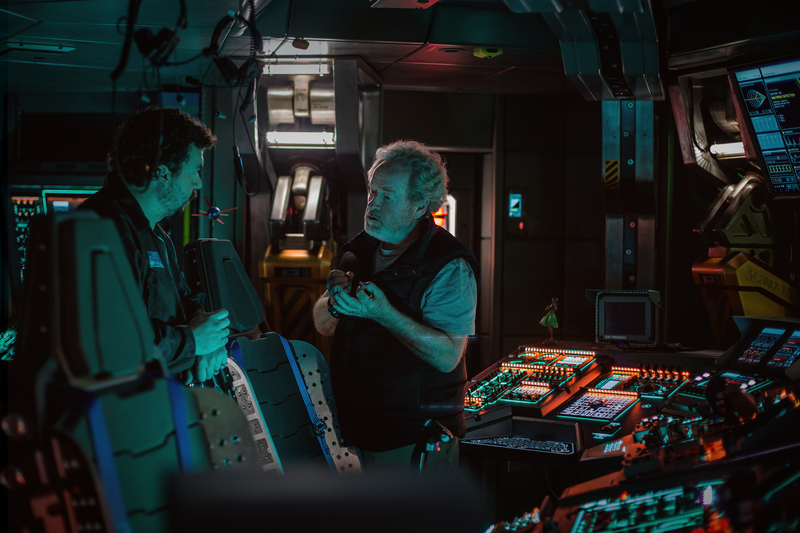 Creating the Alien universe required intricate production design and large set builds at Fox Studios Australia, where the colony ship Covenant and eerily dangerous new worlds from the original Alien and Prometheus were created. Potts Hill also featured a series of giant sets including dozens of writhing bodies frozen in anguished positions on a massive staircase, 20 metre high monuments, stone walls with alien hieroglyphics, desolate alien landscapes, the base of a forest and a space ship. What’s the toughest thing about working on a production as big as Alien: Covenant? Scale and the demands that come with the complexity of a production of this nature. Alien: Covenant is probably the largest “in camera” production the studio has ever hosted. Were there any surprises about working on this film? Alien: Covenant was epic in every sense of the word. From the scale of the overall production, the sets, to the number of people involved in bringing the production to the screen. I’m extremely proud of how the studio coped overall in successfully facilitating this massive production. As Sir Ridley Scott acknowledges in a recent interview on the ABC, “Fox Studios was spectacularly efficient”. What was it like working with one of the greatest Directors in the world? Sir Ridley Scott is a prolific filmmaker. It was a great privilege to work with one of the greatest filmmakers of our time. His energy and creativity are electrifying! Have you seen the Alien: Covenant trailer? Do you like the Alien series? I remember seeing the original Alien film when it first came out at the cinemas. It scared the living daylights out of me. Alien: Covenant looks just as terrifying! Any insider tips for aspiring studio bosses? Be open, be flexible, anticipate, stay focussed, be inspiring and inspired and support and facilitate your team and clients in their needs. What’s your top favourite 5 films of all time? Top 5! Try top 50!! In no particular order, Apocalypse Now, Heat, Shawshank Redemption, In the Mood for Love, Blue Velvet, Citizen Kane, Goodfellas, Touch of Evil, Bridges of Madison County, Vertigo, The Godfather, Pulp Fiction, Copie Conforme, Dr Strangelove, Matador, Strictly Ballroom and Seven Samurai.